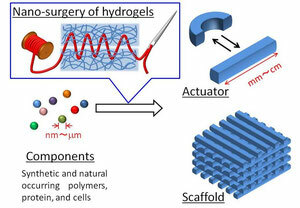 Hydrogels are similar to the macromolecular-based components in the body, therefore, hydrogels have found numerous applications in tissue engineering and drug delivery systems. Hydrogels with a large amount of water, have attracted much attention as substitute material of conventional plastics. The adhesion of hydrogels was difficult, but we successfully adhered hydrogel by electrophoretic adhesion. Therefore, I will move to the next step, and develop “Nano surgery”, “Artificial muscles”, and “Artificial organs” by electrophoretic adhesion of synthetic and natural occurring polymer gels, protein, and cells. We recently reported a novel strategy for the adhesion of cationic and anionic hydrogels. (T. Asoh et al. Chem. Commun. 2010, 46, 7793.) During electrophoresis, cationic and anionic polymers move to the cathode and anode, respectively. Then, polyions were diffused inside of the gels and adhesion was achieved through the formation of a polyion complex at the interface of the two hydrogels. The adhered hydrogels were quite stable in water, and detachment of the adhered hydrogels was also possible by simply applying the inverse voltage. 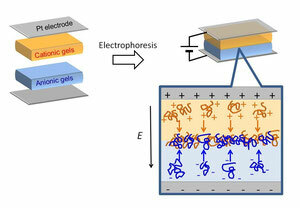 The same hydrogels re-adhered when the ordered electric field was reapplied, adhesion and detachment of the hydrogels via electrophoresis exhibited repeatability characteristics (T. Asoh et al. Soft Matter 2012, 8, 1923.). Polyion complexes composed of weak polyions are not stable in high ionic strength water because of decomposition of formative ionic interaction by salts. However, we found that a deswelling/re-swelling process of the adhered hydrogels induced resistance against bending stress, ionic strength, and inverse voltage because of a rearrangement of the surface interdigitating chain segments across the interface. We then prepared adhered multi-layer hydrogels composed of thermoresponsive and non-thermoresponsive polymer gels, which showed uniaxial movement in response to temperature without detachment (T. Asoh et al. RSC Adv. 2013, 3, 7947. ).